QueBIT Blog: Information or Noise? Let Cognos Analytics tell a story about your data. As the era of information continues to thrive, we seek more and more insight into what this massive volume of data being produced is trying to tell us. What is it saying about our business processes, our business in general, even our lives? Do we see recurring patterns, habits? Are the results of these habits positive or negative, or maybe we can’t tell? We refer to these "patterns" that emerge from this exploration into our data as "Data Stories." Over the next few blog posts we'll explore the key structural components in creating your own data story, as well as delve into some technical tips using Cognos Analytics which help in the telling. How do we define a data story? It is the choreographed delivery of information, which has three main elements which work in concert to convey clear meaning to the consumer. Those elements are the “Persona”, the “Experience”, and the “Mode”. The value of your data lies not just in a single, undeniable truth, but rather in its ability to provide relevance to your perspective on your world. Different pieces of information, different patterns in the information, hold different meaning to people. I care about property taxes in picking a place to live. My colleague Mike might care about night-life. We might be considering the same town in which to live, but we have vastly different criteria and thus the same information may mean something very different to each of us. How do different perspectives tie into this concept of a story? That bridge is based on the first principal of storytelling: knowing your audience. 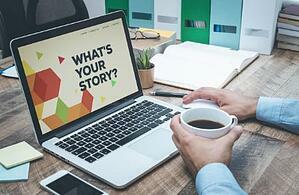 To tell an effective story, the story must mean something to the intended audience. Taken to the extreme that would result in a slightly different story or interpretation for every single person. This is not sustainable, after all how would you ever divine the truth if everyone perceived a different truth? Instead we strive to group individuals with similar interests and/or perspectives. We refer to these groupings as “Personas”. A persona refers to one or more people with a common perspective. Commonly we think of Executives, Sales reps, product managers, etc… as representing distinct groups of consumers for whom we are asked to write reports. These user groups, however, are not the same as personas. A persona might be more accurately defined by what a person does during their work day, not just where they live on an organizational chart. e.g. a CFO and a COO often have very different day-to-day concerns, even if they share the same ultimate strategic goal concerning company profitability. Thus, while we may have defined our “C level executives” as our target user group, nonetheless we must account for the different personas represented if we wish to tell an effective story to all users. Finally, this is not to say different people are not permitted to see all the different perspectives of your data. Rather, we use these personas to put the emphasis on those pieces of information that hold the most immediate relevance to a consumer. This process, emphasizing those relevant pieces of information, is what we'll explore next time with: "The Experience".